This looks amazing that water reflection and the colours are just brilliant and the boys face on the diving board is SO good and he really stands out! You're so good at drawing sides of faces, that's something i struggle with, but your swimming teacher's moustache is fab haha! @Braden-Hallett This is way cool. I love seeing your process. Very helpful of you to share! This is looking so good! Have you fiddled with showing the warm light from the sun hitting your bottom characters? 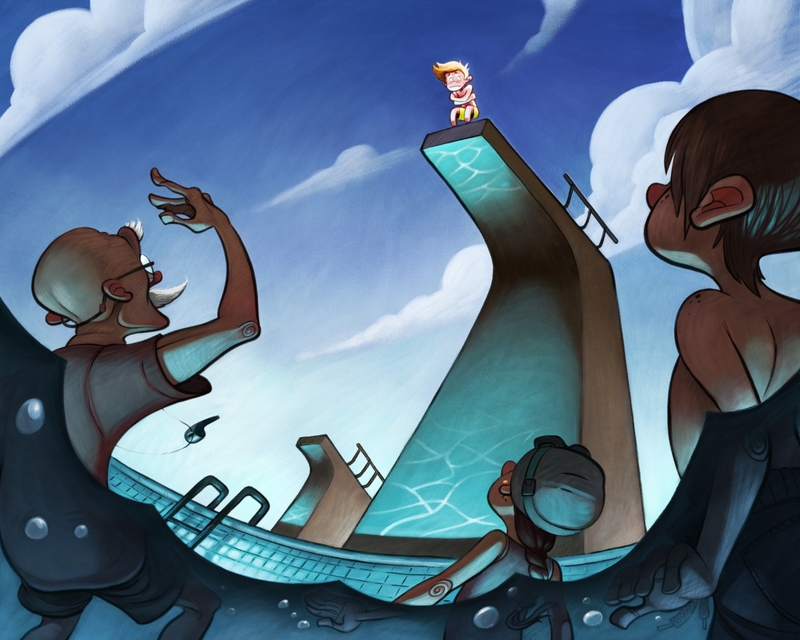 I imagine that you're trying to really highlight the kid on the diving board, which is working very well, I think! You'd know what's best, but I'm imagining that more warm light on the other characters might give the piece a more cohesive feel. The reflected light looks amazing. Thanks for sharing your process again! @Braden-Hallett I like the new texture you put there Braden, only on the skin I don't like it so much, on the skin it looks like the grandpa had some hair on the head and the boy right looks dirty. Also I liked the water little bit brighter, like the pictures before. altogether it is really such great piece of work You did . @Braden-Hallett This is looking so good! not sure if you are looking for feedback or not? I was thinking that the right side of the diving tower should be really lit up by the sun in the same way that the boy is? I think i went a little crazy with my scribble over but i feel like a bit of sun on the side might look right - feel free to ignore of course - as @bnewman said above, it is so helpful to see your process here - thank you for sharing it with us! @Kevin-Longueil Oooh I like the lighting from the sun. @Braden-Hallett Love the texture that's something I was always trying to get in my color work and don't think I ever quite got there. Are you using Painter? I was always having color management problems with it when going back and forth to Photoshop and then I hated that I couldn't have another window open on my second monitor. But I did love how the brushes worked. Are you using the newest version of the software? Wondering if they've gotten any better? @Kevin-Longueil Oh wow that's awesome! I like the strong light on the diving board and such. In this particular case, I'm going to keep my lighting close to as is, though. The reason being that I'm trying to get in the habit of figuring out my lighting in the thumb and comp stage, and then sticking to it. That being said, if I redo the piece (which I might ) I'll totally go your route! @evilrobot I'm using the newest version of painter, yes. What do mean by colour management issues? @Braden-Hallett seemed like when I opened the file in Photoshop (even if I saved the color profile with the document in Painter) The image would look completely different in Photoshop than in Painter. I have painter 2015 still new in the box I was never able to get it to work right. (It might have been that Windows 2010 had some issues messing the profiles up as well) But the no dual monitor thing pretty much kills it for me. I got to have that. @evilrobot painter uses some different layer types that don't necessarily mesh with photoshop. However, photoshop will do its best to interpret those layers (It'll turn a 'colourize' to 'colour' and a few other just to 'multiply') so sometimes if you import a layered file created in painter into photoshop things can get wacky. @Braden-Hallett Actually went ahead and upgraded to 2019 version last night. Now just have to figure out a work flow using it. Hard to mesh painted colors with line work for me you seemed to have figured it out with yours. @evilrobot If you ever want brushes or workspaces, let me know There are all sorts of little magic to sort of make painter behave like photoshop. Have you joined the discord channel for the arts? There's a few SVS students on there and it makes it easy to chat. @Braden-Hallett No what's the discord channel for the arts? lol...And yes, I'd love any help you can offer on Painter.